Hello everyone, a long time ago I made this thing, "Dunc's Algomusic", which makes random music. People occasionally ask me if it is still available, so here it is. There are two versions, Mk III and Mk V. They each have a different feel. In both you can press 'n' and type in a title, it will generate a song from that string. I also don't remember why they were called "Mk III" and "Mk V", when there's only two of them, except to say that I was quite fond of Steve Jackson Game's OGRE. This is is a newer work-in-progress that I started in 2016. "Mk V" was written in Blitz Basic (I've made the sourcecode available too). First of all, thank-you to Gunship_Mark_II at the Vinesauce Reddit for making this available, as I had lost my original. Mk III's claim to fame is that Stuart Ashen used it to make the "Ashen Theme Tune". It was written in, good grief, Dark Basic, and I cannot honestly remember how it got on the internet in the first place. Since people still upload videos of it to YouTube, it must be circulating out there somewhere. Thanks, I'll see what my compile options are as soon as possible. Unfortunately, although I have the compile option for MacOS, I still need a MacOS device. I would need to work with someone who has a Mac and GameMaker Studio. I want to ask you a question. Can I use samples from the "music" folder in my own game? Hi Kat. The site I got them from were publishing them as public domain, so yes. The sounds are courtesty of the Philharmonia Orchestra. The website is http://www.philharmonia.co.uk/explore/sound_samples if you want to grab your own. the 0.6 version is so good at music. even if i didnt put real words in. it is posible to save this as midi? I'm not sure how to do this yet, as it generates the music on the fly rather than pre-rendering it. Also, I haven't found any midi libraries for Game Maker yet. Never try "A New Bird" it creates an permanent loop at 10 tracks, until you change the song of course. Any chance you'd ever be able to make this work on mac? Hi stuckatomega. Only if you buy me a mac. Actually it looks like I can compile an Mk VI executable for Mac OS, although I've no way of testing it. Not much I can do about the older versions. When I next get chance I'll look into it. Is it possible to make the software output a .wav or .mp3 file of a generated song? Hi cannon9009, I do this myself using Audacity. Set your recording device to "Stereo Mix", load Audacity and Dunc's Algomusic, press record in Algomusic, then start the music. Hey, just wondering if it's alright to use tracks generated in VI in weird, probably free indie games, with credit. Hi The Gamer Cat. MkIII and MkV are freeware: distribute as you will and use the audio output for anything. MkVI is under copyright (don't distribute the software), but as far as I'm concerned the music it creates is public domain. Whatever happened to MKI and MKII? They were just Dark Basic prototypes that were never released. I didn't even have an internet account when I made them. With every version of AlgoMusic save for MkVI, a few seconds of music will play before I get the error "Illegal Address Memory", and I'm forced to close the app. I've done everything that I can think of but this continues to be an issue. Can you advise? Unfortunately it's very old software. The only thing I can suggest is to set it to Windows XP compatibility mode, and run as Administrator. This occurred while I was running the program on XP and Windows 7, so I'm not sure. I'll give it another try. What are the limitations for the .wav files? One partiuclar sample pack I tried outputted pure static. Hi, the files need to be in .ogg format. You can convert them in Audacity, or there's plenty of online converters. wait, what? I'm confused. Isn't it packaged with wavs? Oh, hah, I guess it depends what version we're talking about. I can't help much with Mk III and V, as they weren't designed for custom wavs. However, there was a discussion at https://www.reddit.com/r/Vinesauce/comments/66koho/is_there_a_link_to_the_text_t... that might help. Each sample needs to be 16-bit mono and a particular sample rate. I used to own this program back in early 2017 (when I had a windows PC) but I've recently transitioned to a Mac and DAM doesn't seem to run with Wine. (just shows a black screen) I tried installing some Wine directories but still no luck. Any suggestions? I'm afraid I don't know, I can only guess that there's some general incompatibility with the language used, since they are both ancient: Dark Basic Pro and Blitz3D were only for Win 95, 98, XP. I'm amazed they even work on native Win 10 computers. Try any Win XP compatibility options available to you. Since it is a requested feature, I'll be aiming to have the wave files in folders for Mk VI beta. For the prototype it was just easier for me to have it all bundled in. I have another project I'm working on right now (I wish I could do this full time...) but when I return I'll make it a priority. RealMAOUDA, you can change the sound files in Mk VI now, but they have to be .ogg format. Give it a try and let me know how it works out. Interestingly, Mk V doesn't work for me. Mk VI alpha seems to work perfectly. Mk III didn't work either. Fixed it, DirectPlay was disabled. Just got a few bugs to iron out then I think we'll have a public alpha of Dunc's Algomusic Mk VI. This is really good. MK V is great for background music, or game soundtracks. If it were to be used in productions like that, what would I need to do to credit you? Thanks, I've used it myself in the past, for bed music for a radio segment. As I've made Mk V public domain you don't strictly need to do anything, but a link to this page would be a courtesy. Rap beats, quick and easy! Both versions of this program won't run on my computer. I'm running Windows 10 Pro 64bit with an Intel CPU and Nvidia GPU. I get this error: "The application was unable to start correctly (0xc0000022). Click OK to close the application." Gonna go through the executable with Process Monitor and see if I can find anything of interest. Welp just fixed it. I think it was a DirectPlay issue with Windows 10. Had to go to C:\Windows\SysWOW64, find the file called "dplayx.dll", and give myself full permissions in the security options of it's properties. After that, I enabled DirectPlay in the Windows' Legacy Components. (Control Panel > Programs > Turn Windows features on or off > Legacy Components > Tick DirectPlay). Program runs completely fine now. Cheers. I love you <3 This fixed the problem, just have to run it as admin. Also ticking the option reset the security rights so it may of been a moot point unless you do it AFTER you check the legacy direct draw box. But the .exe now runs when i launch it, you may of also just fixed another issue such as my problems with command and conquer red alert 2. I'm in the "thinking about" stage of Mk VI. I need to find an audio module for python that is a) small and b) works. It needs to be small, because I'll be using pyinstaller to make a Windows executable (I don't want to have to ask people to install Python), and it bundles the module with it. For example, I don't want to bundle in pygame if I'm just using the audio functions. The few I have looked at don't work with Python 3 or just don't work. Please also understand that I don't have the free time I used to have 10 years ago, I get maybe a 1 hour (at best) window each day for coding, and I'm sort of focusing on another project ( https://marasmusine.itch.io/crystal-orb-adventures ). Which version is considered superior? MKIII was working fine, but it seems to crash now and then, will this just happen with certain keywords? Thinking about a new version, there are Python modules for creating MIDI, and modules for playback. I don't think I can create and play MIDI on-the-fly. That would mean 1) It won't play endlessly. 2) There will be a delay before music starts playing (as it generates the track). Personally, I like that AlgoMusic plays endlessly and plays new titles immediately. What to do? I would like to have something with higher sound quality. Maybe you could upload it as a separate program so you could choose to have both? As in higher sample rate, or the sound mix (or both)? I meant sample rate, but a larger collection of sound files for more diverse songs would be pretty sweet too. You could always do it the stupid way: instead of true midi, just have it play all the individual sounds independently. What are the usage rights for this software? I've made them public domain. If you use or distribute it, attribution and link here would be nice of course! They will go on endlessly. I think Mk V crashes after a while. Is it possible to save the generated music? Not directly. I used to use Audacity to record the audio output, so I recommend that. 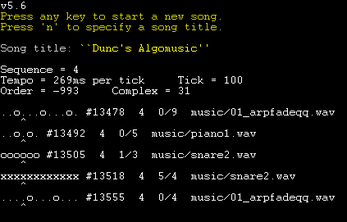 If you just want to save to play in AlgoMusic later, all you need is the name of the song. Hi there. I was the anonymous source code requester. I wanted to ask, are you absolutely sure there's no way to find the Dark Basic Mk III source code? I really like reviving old apps, and it would be cool to see how it worked. When I checked my backup CDs, I only had some stuff from Dark Basic Pro (which I got after DB). We're talking 10 years ago here, I've changed computers 5 times since then and had several backup HDs fail... I will scour them again though! From what I can remember, Mk III used little pre-fab melodies of 2 to 4 notes to create a "base" section. It would change this over time but occasionally return to the original. As you might be able to tell from the tracker, it can create variant sections that it cycles through, and some channels echoed others, and it throws in random chord changes. The name of the song is the seed for the RNG. Mk V ditched the pre-fab melodies and tries to make its own, the result is more experimental and less catchy, which might be why Mk III is more popular. Yeah after HOURS of trying, I simply cannot get this to run on my windows 10 machine WHAT SO EVER. All ive noticed is that for some reason it wants to keep itself as read only, but only on the top folder level, files in it are still fine. I tried allowing access through DEP, Through the Firewall, gave it every permission feasable next to god system access and even did a SFC scannow to make sure all my dll's were in order. Thats a giant bummer because this is the best rig i have to be able to record footage and id like to make some youtube vids or something in good quality. My only guess is that the new cpu's or hardware simply dont have the old tech in it to process this. Was it the "(0xc0000022)" error that you were receiving on Windows 10? I was getting that error too. I had some time to kill so I investigated the problem and found it was rooting from the system file "dplayx.dll", which is used in DirectPlay (which is disabled by default in Windows 10, to my knowledge). To be safe I went to C:\Windows\SysWOW64\, found the .dll, and went into it's advanced security settings and granted myself full access to it. After that, I enabled DirectPlay in Legacy Components - (Control Panel > Programs > Turn Windows features on or off > Legacy Components > Tick DirectPlay and apply). After that the program finally ran successfully. Not for these versions, no, the languages I used didn't haven't native MIDI support. I tried to use these, it wont work at all, I allowed the exception in the DEP settings (you physically cannot turn it off in windows 10, just allow exceptions) and even used several compatibility settings and nothing. I'm not sure if it's a compatibility issue, as they both run okay on my Windows 10 computer without changing any compatibility options. Can I make sure (and sorry if these are dumb questions), is it all unzipped, and are the subfolders present (/music for Mk V, /wavC etc for Mk III)? Well im using the itch.io app which automatically downloads and installs the game to a folder so it extracts it. I also downloaded them seperately and unzipped them. v5 just has the music folder next to the .exe with a text readme file. Also you should delete the readme as the page http://www.wikihost.org/w/doodleblog/dunc_s_algomu... leads to what could potentially be virus laiden websites, it attempts to load several redirected websites which my chromium blocks. the v3 includes several folders, drum, wavC, wavE,wavG DAM.txt and the duncalomusic.exe. Ive also used 7zip to extract the .exe within the extracted folder just for kicks and still have nothing. Ive added the programs to my exception in the DEP settings, and ran the .exe in every compatibliity mode i can think of. I have windows 10 pro 64bit. nvidia 1050ti, 16gigs of gskill ram, and an i5-2500. And yes i know its just a small text based thing, but still wanted to post the specs just in case. Oh the error i get is "this application was unable to start correctly (0xc0000022). Click OK to close the application." Okay, tested this on another windows 10 computer and it works. Not sure why that worked and this didnt. Do you need java installed or anything like that? The Dark Basic and Blitz Basic compilers were both self-contained, but they are both ancient now so it's unsurprising there'll be some issues. Thanks for pointing out the wikihost thing, that's where it used to be hosted like 8 years ago but it doesn't exist anymore. I'll update it later. yeah i just CANNOT get it to run on my gaming rig, but my frankenstein of a computer thats a 2008 mac pro jerryrigged to run windows 10 64 bit with the xeon processors works just fine. And Im using google drive so the file is synced so its quite literally the same file and folders and works fine on one windows 10 and not the other, though my current pc is running creators update and the other isnt, I will update it and see if i lose access to the files. After some sleuthing i found that it cannot creat the dplayx.dll for some reason C:\Windows\SysWOW64\dplayx.dll, access denied even with admin rights and given it everyone status. very weird.